Often a client will call and ask me why they should spend the money on a home inspection for a newly built home. After all, shouldn’t a brand new home be perfect? I have two words for those clients: Construction Oversight. It is not necessary to have a home inspection report generated for brand new construction prior to contract signing because the home or unit is brand new there is nothing to negotiate everything is new. By doing a home inspection prior to contract signing you are basically wasting your money. There will be things incomplete or not installed yet and the promise of them being done next week or prior to closing is quite common, however making a “punch list” at the time of contract signing of things obviously incomplete by yourself, to give your attorney is advisible, and recommended, as well as a list of all appliances and fixtures promised to you to be included in the purchase. Common oversights that I find include incomplete electrical systems, incomplete plumbing, gutters that are incorrectly installed, missing roofing components, damage to walls and floors, fireplaces that are incomplete and many others. The reasons construction oversights occur vary from inadvertent omissions to just plain bad construction practices. For clients who are purchasing a custom built home it is wise to hire an inspector to act as their advocate to make sure the quality of construction is the best possible. 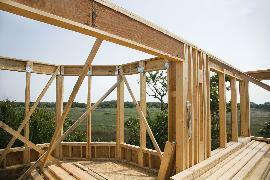 Home inspectors who participate in the construction process can help prevent costly mistakes for the home owner. The home inspector also helps you understand your new home and its systems. I like to show the new home owner where to reset circuit breakers for various systems like the garage or outdoor electrical outlets. I inform the new home owner on what to expect in the first year. For example, it is typical to have a few nail pops here and there as the home settles. I point out areas of the yard where settling may occur and how to prevent drainage issues that may result in a wet basement. Hiring an experienced home inspector to complete a diligent inspection of your newly constructed home is a wise decision. Be informed about your new home and make a successful transition. A home inspector who works for your best interests will find those oversights that may affect your pocket book and your family’s safety. 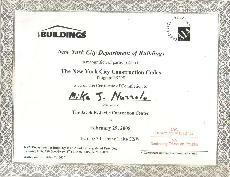 In the past, professional contractors have had the option to use the 1968 Building Codes or the new NYC Construction Codes, however beginning July 1, 2009, all filing and approved plans for new construction after this date must comply with the new NYC Construction Codes. The new NYC Construction Codes enhance building and construction safety through expanded requirements for fire protection, structural integrity and job site accountability on all new construction projects. I do recommend that you have a qualified professional accompany you on your final walk-through, to ensure this home is properly constructed and completed, with all its safety features intact… It’s all about safety!